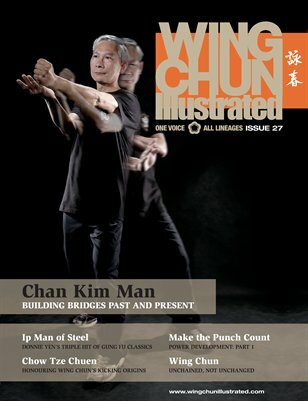 Issue 27 of WCI features Sifu Chan Kim Man on the cover. Sifu Chan is a Hong Kong native who found his path in his Wing Chun journey under the tutelage of the late Sifu Wong Shun Leung. From 1979-1982, he contributed to the reputation of the Wong Shun Leung Ving Tsun lineage’s efficacy by competing and winning in competitive events. Today, Sifu Chan Kim Man is conducting classes in Hong Kong, Panyu District, Shigang Dong Village, Shiji Town, and Guangzhou City, aiming to achieve the unfulfilled wish of the late Sifu Wong Shun Leung to reacquaint the Chinese people with the Wing Chun system. For a complete table of contents, please visit our website.